BMS or Bachelor of Management Studies is a popular career choice amongst commerce students. We shall give you a brief idea of BMS Course, its eligibility conditions, BMS Subjects, its scope and BMS fees details. We have been receiving different queries from students regarding details on BMS Course. So, we thought of covering an exclusive post on BMS Course or Bachelor of Management Studies. You shall get an answer to important aspects of this course. 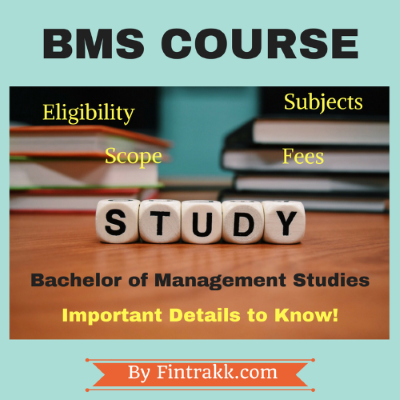 What is BMS Course eligibility and what is the estimated fees for joining it? What are the subjects that you shall study as a part of this management related course? What’s the scope of pursuing BMS? As the name itself suggests, BMS Course is focused towards the field of management studies or we can simply refer it as a management education programme. Today’s corporate world is in need of professionally qualified and efficient management graduates. BMS course plays a pivotal role for imparting the requisite management and business skills to students and make them competent to enter the corporate zone. Bachelor of Management Studies is an undergraduate course. A 3 year course which can be pursued from a regular college or university. You also have the option to do it through distance learning as per your convenience and affordability. Classroom lectures: Like any other course, you have regular classes to attend and learn about different subjects in your curriculum. Practical Training: BMS Course consists of project work wherein you need to show skills as a team worker in your final year. You may to go for Industrial training to practically know to implement the management skills that you have learned over the years. Students who complete their 12th standard or its equivalent are eligible to join the BMS Course. You might be from any stream i.e. Commerce, Science or Arts and from a recognised educational board. However, being from the relevant background definitely helps, Commerce students get an advantage over others. Important: Please note that the availability of subjects might vary for different colleges and institutes. We are just mentioning the main ones. This means you can get to study a different combination of subjects in BMS based on the college/institute where you wish to study. Also, some colleges may conduct an entrance exam for testing your calibre and giving you admission. You need to check that out in the respective college. Fees is a vital component to know in any course. Right! The BMS Course fees generally varies as per different colleges and universities. The fees shall be relatively lower in Government colleges as compared to private institutes. The total course fees ranges between Rs.1 lakh to 5 lakhs based on the college where you wish to join this course. Further, there might be a revision in the fees towards the upper or lower side as per the norms of the college where you take up this course. Before taking admission into a particular course, you surely need to check the estimated fee details. So, go through the prospectus or verify from the college/university about the fee structure beforehand. These days, a variety of Government as well as private colleges may offer BMS Course. But, remember completing a course from a famous and reputed institute/college usually gives a better advantage and additional benefits to students in terms of education, placements and salary later on. So, plan well to join a good college to lay a solid career base. Joining just any college for the sake of getting a degree won’t help you much. Do proper research and get adequate feedback from elders and seniors before taking a decision. There might be a merit based admission process based on the ranking and status of the college. So, if you wish to go ahead with this career, just make sure to clarify all the important factors initially. BMS is a relatively newer addition to the list of courses after 12th commerce. The fees is higher than a normal B.com degree. You may also require to put in some extra efforts like project work, training etc. Doing BMS course alone won’t fetch you much in the long run. You have to think of planning a complete road map ahead and further opt for an Master of Business Administration (MBA) or Master of Management Studies (MMS) or any good Post Graduation course to have a successful career. BMS or Bachelor of Management Studies makes you ready for managerial positions in the corporate world. The top recruiting areas include business firms, banks, marketing & sales firms, financial firms and academic institutes etc. However, if you are looking for a simpler option, then Bachelor of Commerce (B.Com) might seem to be an easier choice to make. Also, note that some institutions have revamped and renamed the name of earlier management programmes offered like Bachelor of Business Administration (BBA) by the new name Bachelor of Management Studies (BMS). So, don’t get confused, just check with the respective college for the same. Now, that you got some relevant and useful information on BMS Course or Bachelor of Management Studies. We hope this will guide you in taking a wise and correct career decision. What are your career interests? Which course do you wish to pursue after completing your 12th standard and lay a strong career foundation? Are you looking for details on any other career option after 12th or different course details, feel free to discuss in the comment section. Can you share list of colleges offering BMS besides Delhi University. I got 60% in 12th class, so which college is best for BMS in Mumbai? Please guide. Can you briefly explain scopes in BMS? Is it a good choice? Please guide. Hi, My son will appear for class 12 exam next year. He is in commerce with entrepreneurship. Can you please suggest me a college, eligibility and course fees for bachelor of management studies course? I just want to know the link between BMS and IIMs. I am very confused about these two, what are they? Is it compulsory to complete graduation to appear in IIMs exams? From where should we do graduation and fetch which degree to appear in IIMs exams? Any idea. Do management courses have a real scope in India? There are so many diploma and degree courses. I really wonder which one is actually going to assure a good job ahead. « Personal Loans for Salaried Individuals: Are you eligible?